Beautiful old building. Plenty of character. Parking nearby. Location, cleanliness and comfort. The owners contacted us quickly when a problem arose. Lovely apartment, lots of light and beautiful views. Well equipped and spacious. A superb place to relax. The city centre is only a 20 minute walk and there are plenty of places close by to purchase food and essentials. Easy to find and managed to park outside the property. We used it as a pit stop stop so didn't get to see the local area or Bath. Pizza hut deliver which kept the kids happy after a long day on the road. Loads of sofa beds to choose from and great facilities. Not only was the interior elegantly decorated, and the house itself beautiful , we were stunned by the full blossoming deep pink magnolia outside the windows of the living room! The room was fairly large and comfortable. Although impersonal the instructions and key finding were easy. The apartment was BEAUTIFUL and very clean! The location was good, about a 25 min walk to the centre but plenty of pub/ bars en route. Bed super comfy and the rooms were large with high ceilings & also the view was lovely. Lock in a great price for Grosvenor Apartments - rated 8.6 by recent guests. One of our bestsellers in Bath! Set in a historic 18th century building, Grosvenor Apartments feature high ceilings, large windows, marble fireplaces and views. 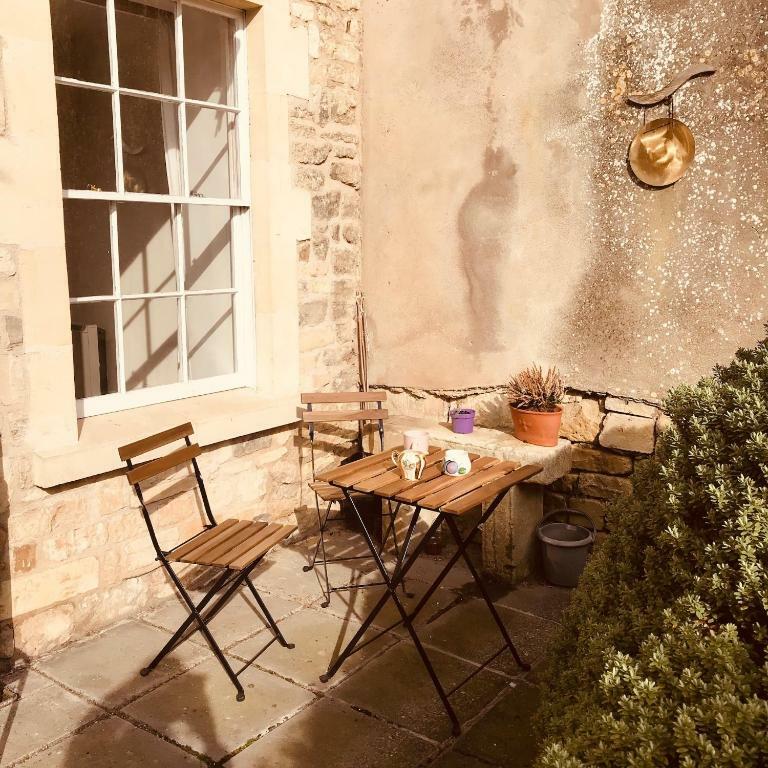 The property offers an easy access to the Kensington Meadows nature reserves, the Kenneth and Avon canal and Larkhall village, and is within 20 minutes level walk to the historic centre of Bath. The property is a fully refurbished Grade I listed building, with free WiFi featured throughout. All units have a seating and dining area with a flat-screen TV. There is also a kitchen, equipped with an oven, toaster and fridge, a stovetop and a kettle. There is a private bathroom with free toiletries and a hairdryer in every unit. Linen and towels are available. Bath Abbey is 1.1 miles from Grosvenor Apartments, while Royal Crescent is 1.1 miles away. The nearest airport is Bristol Airport, 15.5 miles from Grosvenor Apartments. Grosvenor Apartments has been welcoming Booking.com guests since 27 Dec 2016. When would you like to stay at Grosvenor Apartments? Guests are required to fill an online registration form and provide a copy of the ID for verification to get the key instructions. Guests who pay via virtual credit card will be contacted by the property to provide payment details for the security deposit. Located on the ground floor, this apartment offers a view of the gardens and meadows. The bedroom is 20 sqm with two Georgian windows and has a king-size bed or 2 single beds, a futon, a wardrobe, a dressing table and a chest of drawers. The living room is 40 square metres and has 2 reclining sofa beds, a dining and a sitting area. There is a fully equipped kitchen with complimentary tea, coffee and condiments. The bathroom has the towels and toiletries. Two guests can request a king-size or 2 single beds. Located on the first floor, this apartment offers a view over the meadows. The bedroom is 20 square metres and has a king-size bed or 2 single beds, as requested. The room features a king-size bed or 2 single beds, a sofa, a wardrobe, a dressing table and a chest of drawers. The living room is 40 square metres and has 2 reclining sofa beds, a dining and a sitting area. There is a fully equipped kitchen with complimentary tea, coffee and condiments. The bathroom has the towels and toiletries. 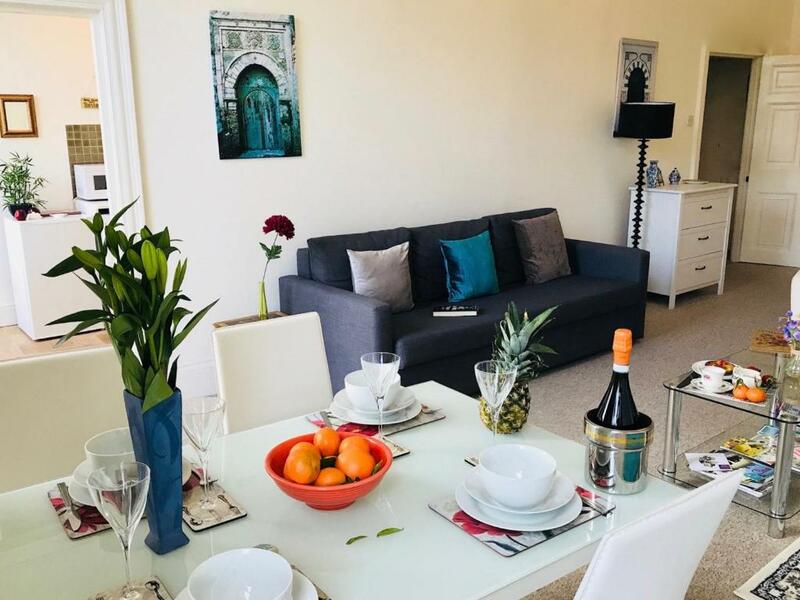 Enjoy the best of the both worlds: Grosvenor Apartments are located in a quiet residential area away from the city hassle but within only 20 minutes level walk to the centre. Wake up to the birds singing and have a fresh croissant from a local bakery. 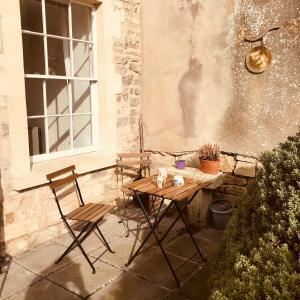 Walk away from the tourist route and have the best of what the locals love: gastropubs, Morrisons, Bath&Avon canal, natural reserve, antique shops and artists galleries - all within walking distance. Parking is free and is available at the front and back of the building. Taxi ride to town is only 5 minutes and the bus stop is in front of the house. The house is real historic Georgian property 225 years old, you can experience the magic of its huge rooms and high ceilings and original 18th century windows. Live like a local, feel like a king - we provide towels, linen, there's a coffee machine and a fully equipped kitchen. We offer free toiletries, biscuits, tea and complimentary orange juice. There's a high chair for kids, colouring books and crayons. Enjoy the view over the meadows and the canal. Our apartment is great for families and groups of friends of all ages. We love our house and want to give you the best experience of living in a historic Georgian building. Grosvenor apartments offer a home away from home, spacious and stylish. Great for a romantic getaway, a weekend break, a midweek stay, a corporate rental or extended stay. We offer fully equipped kitchen, professional cleaning and linen, comfort and autonomy for our guests. Check in any time between 3pm and 11pm and checkout at 11am, you don't have to agree your arrival time with us. We are VAT registered and can provide an invoice to our corporate guests. Our one-bedroom apartment offer a king size bed convertible into 2 singles and 2 or 3 sofa beds. Studio apartments have a king-size and a sofa bed. Full size bathroom and kitchen is in every apartment. All apartments are in one house, convenient for groups (we can host groups up to 16). House rules Grosvenor Apartments takes special requests - add in the next step! Grosvenor Apartments accepts these cards and reserves the right to temporarily hold an amount prior to arrival. Please note that the check-in and key-collection take place at: Special Location, ba16ax Bath. Discovered no power at the flat upon arrival. A huge bag of ice cubes in the freezer had defrosted, leaving a pool of water on the kitchen floor. It took 2 hours to contact a member of staff to advise. The staff member was very helpful. However, a second simply sent a text to say that they had never experienced this problem before! Not helpful when the flat had no power! The bathroom needs attention. It’s dated & smells musty. The check in process required a masters in computing or the help of a twelve year old.We weren't happy about providing photos of id and documents required an electronic signature. Not that easy for older people. There was a lack of toiletries and powder for the washing machine. Beds., Toilet also all facilities. It was pretty cold. Heat storage units work well in the long term, but the was no way of getting heat immediately if you felt cold. No even in the bathroom, were the heater was not working. The general nice feeling and cosines of the property. It felt like home. It was absolutely fantastic that the host could provide a cot bed for our baby at not extra cost, even though that was not in the initial plan. The location is a bit further from sites and restaurants than anticipated. We ended up using Uber a lot - 1) because of the distance to things and 2) the weather was not great for walking anyway. In warmer/sunnier weather we probably would have walked back and forth a little more. The apartment is clean and comfortable. The added bonus of a washing machine for laundry really helped us be flexible mid trip. It was a great place to spread out and relax after a day of sight seeing. Broken shower, and sash window! Space and size of the apartment! The kitchen was a bit basic. No dislikes just niggles Better pillows needed. Taps in bathroom too small making them difficult to turn off. Bathroom very small for 5 adults. The master bed was lovely but the pull out beds for those staying in the living room weren’t particularly comfy and the shutters on the windows in that room didn’t fully sit flush to the glass so let in quite a lot of light in the morning. Didn’t impact on overall stay though as we were up early anyway. Lovely period property that was spacious, clean and had great facilities. The location was superb and the accommodation quiet. Easy and stress-free check-in and check-out process and quick and helpful communication from the hosts. Overall a great stay and would not hesitate to book another stay here if visiting Bath in the future.